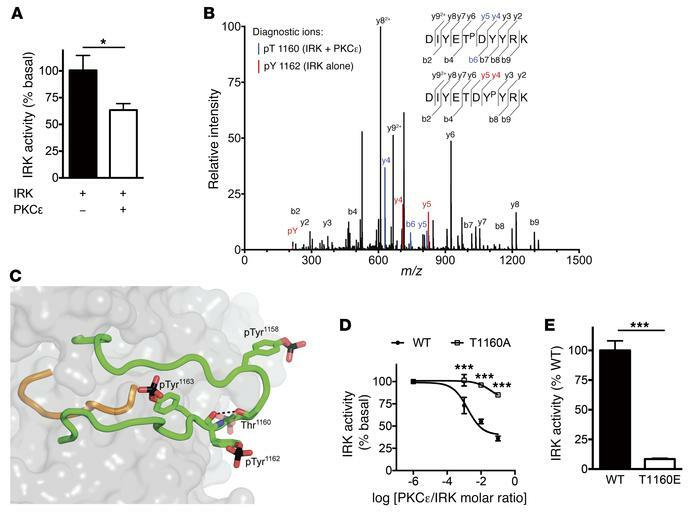 PKCε phosphorylates the INSR at Thr1160. (A) IRK activity with and without equimolar PKCε preincubation in vitro. (B) Overlaid MS/MS spectra of the T1160-phosphorylated peptide DIYETPDYYRK (identified only in IRK + PKCε samples; unique peaks are shown in blue) and the Y1162-phosphorylated peptide DIYETDYPYRK (identified in samples with IRK alone; unique peaks are shown in red). An Andromeda score of 167.67, a localization probability of 68%, and a 4.3 Delta score between pT1160 assignment and pY1162 assignment supported assignment of phosphorylation to T1160. pT, phosphothreonine. pY, phosphotyrosine. Y and B series MS/MS fragment ions are defined with respect to primary amino acid sequence at upper right. (C) Mechanism by which Thr1160 phosphorylation inhibits IRK activity. The crystal structure of phosphorylated, activated IRK (19) is shown, with the activation loop in green, the catalytic loop in orange, and the rest of IRK in gray (surface representation). The 3 phosphotyrosines in the activation loop are shown as sticks, as is Thr1160 (carbon atoms in green, oxygen atoms in red, nitrogen atoms in blue, and phosphorus atoms in black). The side chain of (unphosphorylated) Thr1160 is hydrogen bonded (black dashed line) to the backbone carbonyl oxygen of phosphorylated Tyr1162 (pTyr1162). If Thr1160 were phosphorylated (hypothetical phosphate group shown semitransparently), the activation loop could not adopt this configuration because of steric clashes and electrostatic repulsion with pTyr1162. (D) In vitro kinase activity of recombinant WT or T1160A IRK at several PKCε concentrations. (E) In vitro kinase activity of recombinant WT or T1160E IRK. Data represent the mean ± SEM. (A) *P < 0.05, by unpaired, 2-tailed Student’s t test for 5 technical replicates per group; (D and E) ***P < 0.0005, by unpaired, 2-tailed Student’s t test for 3 to 4 technical replicates per group.